What makes your window profiles strong and safe? Every architectural structure has windows and doors. Windows and doors are necessary requisites because of ventilation and sunlight. But they are also our safety net, they make our homes secure and let us sleep peacefully at night. But, do you wonder if your window profiles are strong and secure enough? Do you know what goes into the making of nearly indestructible window profiles? In recent times all the window profiles used in homes and offices alike is made up of uPVC. uPVC can be defined as non-plasticized polyvinyl chloride, a rigid and chemically resistant form of PVC. They are highly resistant and durable, making them the perfect choice for manufacturing window profiles. Let us review a few features of these uPVC window profiles to understand how it is manufactured and what makes it so resilient. All of these window profiles are manufactured with the use of German extrusion lines and follow European standards of the manufacturing procedure. The technology used to design these window profiles puts a sharp focus on strength and robustness, hence precision engineering is found in every inch of these window profiles. The window profiles are all manufactured with the latest German technology to meet with the stringent European safety standards. 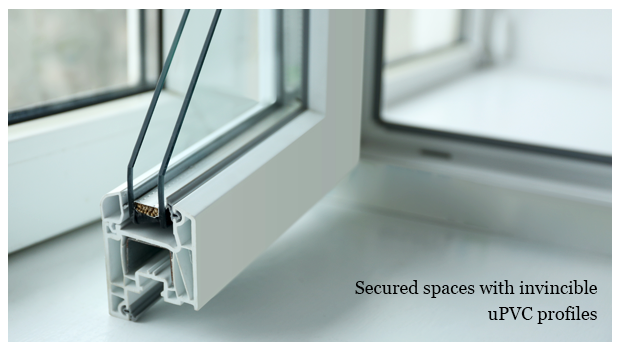 All of the machinery is NABL accredited to produce the safest uPVC profiles. To make all of the window profiles heavy-duty, suitable galvanised steel reinforcements are provided. They are usually provided to reinforce the window profiles with extra strength to make it more durable and everlasting. As an additional benefit, custom-made reinforcements are also offered with varied thickness based on the requirement. To make the window profiles safe and secured for children, it is vital to produce these profiles in ways which comply with the RoHS certification directive. It regulates the use of toxic materials in the window profiles and is formulated based on the European standards of safety. With a determination to build safe and strong window profiles, uPVC came into existence and it has constantly proved its mettle. By using uPVC window profiles, you can deter break-ins and intrusions. It will provide a healthy, safe and secure environment to live and work in. Want your homes and office spaces to be safe and strong? Explore more at https://okotech.in/one of the most trusted window profile manufacturers in India.